Professor Kazimierz Laski passed away on 20th October 2015, shortly before his 94th birthday. The current issue of the wiiw Monthly Report is devoted to the former wiiw Director of Research, who has in many ways guided and inspired the institute’s work and academic discourse. Professor Laski’s colleagues and companions Michael Landesmann, Martin Riese and Herbert Walther are remembering in their joint contribution Professor Laski’s turbulent life and his scientific merits in the field of macro- and transition economics. 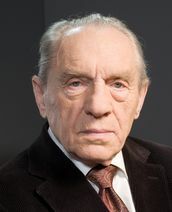 Jerzy Osiatynski recalls the most impressive milestones of his life and introduces his main periods of research, which, Professor Laski himself divided into three phases: “(i) prior to Kalecki, (ii) with Kalecki, and (iii) after Kalecki”, referring to the Polish economist Michal Kalecki (1899 – 1971). Finally, the Report provides two reprints: an autobiographic note by Professor Laski and a critical article on current EU economic policy, which he published jointly with Leon Podkaminer in 2013.